Many of the pilgrims who walk the Camino de Santiago carefully planned each of the stages to enjoy our walking through the jacobean route, but without forcing us to not exceed our limits and making the experience becoming too difficult. But that's just one way to enjoy the Camino; others go much further and take advantage of the ancient route to express their full mental and physical abilities, such as the 132 soldiers who have arrived in Santiago de Compostela this weekend. Organized in 22 patrols, intervention units from United Kingdom, Belgium, France, Portugal and Spain (four times more international presence than in 2015) have completed these days the 120 kilometers from the city of Tui from Santiago de Compostela at a rate of another planet. They have done exceeding seven types of tests, including precision shooting, abseiling descents, crossing a river loaded with equipment (in areas of strong current) or obstacle courses, among others. 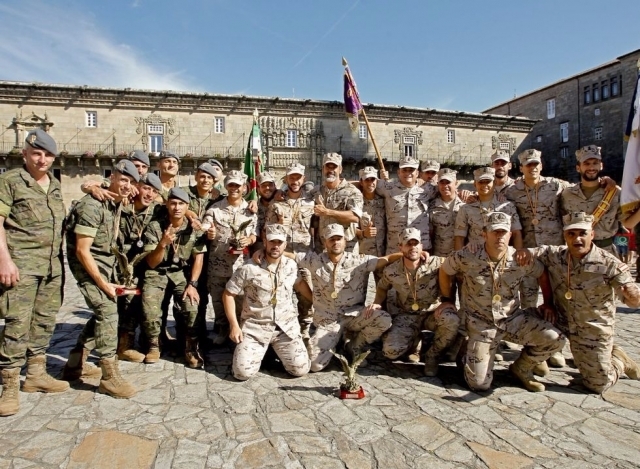 The test this year celebrates its second edition and is organized by the BRILAT (Brigada de Infantería Ligera Aerotransportable 'Galicia' VII) , providing ten patrols, while four belong to armies international allies and eight other bodies of the Spanish Armed Forces. BRILAT is settled mostly in the privincia of Pontevedra and this year celebrates its 50th anniversary, playing host this particular competition in the Camino de Santiago.